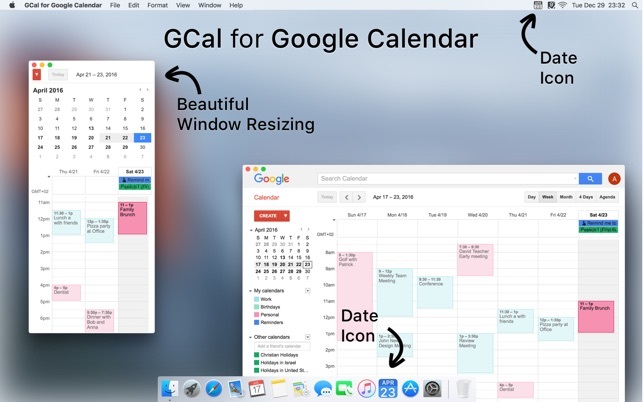 GCal for Google Calendar is the Best Mac app for Google Calendar. Keep track of life's important events all in one place that gives you fast and instant access to Google Calendar without ever needing to open your web browser. 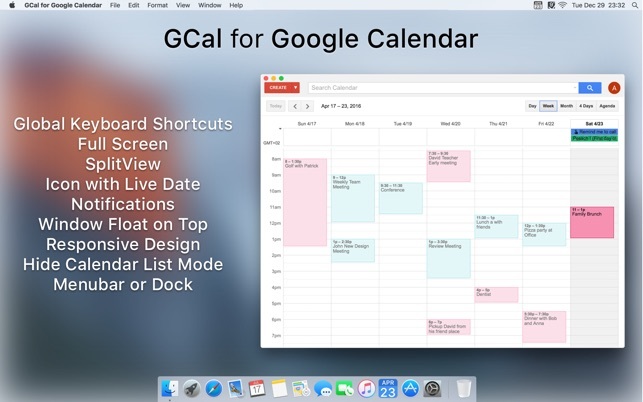 • Instant access to Google Calendar via your Mac's menu bar or Dock. • Fast and responsive design. • Get alert directly into Notification Center. • Very easy to add events or appointments and share. • Global Hot Key to open app or create events. • Search Bar to find events quickly. • Resizable window with responsive design. • Visually amazing design and interface. • Built with the latest available technology for an amazing experience. NB: An Internet Connection is needed to use GCal for Google Calendar. Offline mode not supported. GCal for Google Calendar is not affiliated with, associated to, nor endorsed by Google in any way. Google, and the Google Logo are trademarks of Google Inc.
We've worked hard to make GCal for Google Calendar as simple and efficient as possible for you to use. We would love to hear your thoughts via email and make any improvements to future versions of this app. We intend to have an active development cycle powered by your feedback, love and support! macOS system font is now used for a gorgeous rendering. All images, icons are now nicely rendered with retina. Enhanced design for a beautiful integration with macOS Sierra. Bug Fixed, Shortcut keyboard for changing view type was not always responding. Bug Fixed, 'Enter' key was sometime not responding properly in Description field. Bug Fixed, Could not create new list in Task. Bugs fixed for Czech, Japanese and few other system languages. I just bought the App, and it is exactly what i was looking for and I love it, but there are some slight glitches in this app! When you press the menu key in the upper left, or the tasks panel on the upper right it bugs really wired. It works properly, but I would like to see this fixed, since this is a paid application! Keep up the great work!